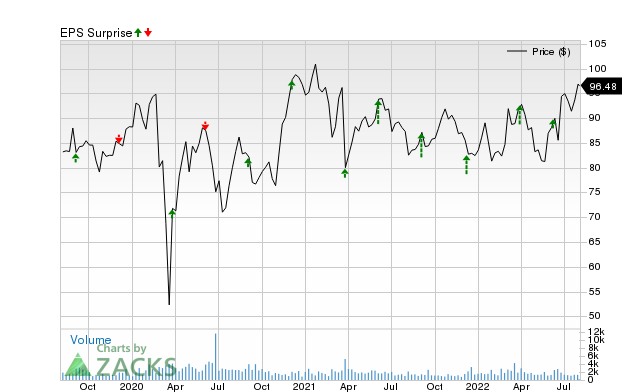 Can SAIC (SAIC) Keep the Earnings Surprise Streak Alive? Have you been searching for a stock that might be well-positioned to maintain its earnings-beat streak in its upcoming report? It is worth considering SAIC (SAIC), which belongs to the Zacks Computers – IT Services industry. This information technology company has seen a nice streak of beating earnings estimates, especially when looking at the previous two reports. The average surprise for the last two quarters was 27%. For the most recent quarter, SAIC was expected to post earnings of $1.02 per share, but it reported $1.13 per share instead, representing a surprise of 10.78%. For the previous quarter, the consensus estimate was $0.81 per share, while it actually produced $1.16 per share, a surprise of 43.21%. For SAIC, estimates have been trending higher, thanks in part to this earnings surprise history. And when you look at the stock’s positive Zacks Earnings ESP (Expected Surprise Prediction), it’s a great indicator of a future earnings beat, especially when combined with its solid Zacks Rank. SAIC has an Earnings ESP of +1.70% at the moment, suggesting that analysts have grown bullish on its near-term earnings potential. When you combine this positive Earnings ESP with the stock’s Zacks Rank #2 (Buy), it shows that another beat is possibly around the corner. The company’s next earnings report is expected to be released on September 6, 2018.